It's an understatement to say that last year was a big year for Audi. Celebrating the company's 100th anniversary, Audi had plenty of events to commemorate such a joyous and monumental year. 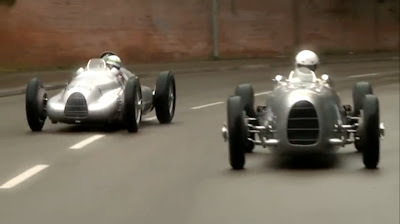 One such event was a "race" of sorts set in Audi's hometown of Ingolstadt. Audi drivers ranging from Walter Rohrl to Allan McNish, got an unrivaled opportunity to drive nearly every Audi race car ranging from an Auto Union Silver Arrow to today's R15 TDI Le Mans racer.